(1) This Act may be called the Kerala Prohibition of Ragging Act, 1998. (2) It extends the whole of the State of Kerala. (3) It shall be deemed to have come into force on the 23rd day of October, 1997. 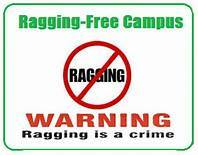 3.Prohibition of ragging.– Ragging within or without any educational institution is prohibited. Whoever commits, participates in, abets or propagates ragging within, or without, any educational institution shall, on conviction, be punished with imprisonment for a term which may extent to two years and shall also be liable to a fine which may extent to ten thousand rupees. Any student convicted of an offence under section 4 shall be dismissed from the educational institution and such student shall not be admitted in any other educational institution for a period of three years from the date of order of such dismissal. (1) Whenever any student or , as the case amy be, the parents or guardian, or a teacher of an educational institution complaints, in writing, of ragging to the head of the educational institution, the head of that educational institution shall, without prejudice to the foregoing provisions, within seven days of the receipt of the complaint, enquire into the matter mentioned in the complaint and if, prima facie, it is found true, suspend the student who is accused of the offence, and shall, immediately, forward the complaint to the police station having jurisdiction over the area in which the educational institution is situate, for further action. If the head of the educational institution fails or neglects to take action in the manner specified in section 6 when a complaint of ragging is made, such person shall be deemed to have abetted the offence of ragging and shall, on conviction, be punished as provided for in section 4.